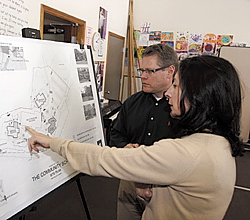 Ketchum-based architect Michael Doty and Pat Aluisi, a Community School parent, explore site plans depicting renovations of The Community School?s Trail Creek campus in Sun Valley. See story below. Do better 'things' make a better life?